In Sapiens: A Brief History of Humankind, Yuval Noah Harari asks the question: Will the three major historical revolutions that have shaped the world we see today bring about the end of the species we call Homo sapiens? As Harari contemplates this question, he takes us on a “brief” 13.5 billion year tour of physics, biology, politics, religion, culture, and science. In four major parts, he does so in a way that ensures readers won’t get lost. In Part Two, Harari delves into why the Agricultural Revolution exposes “history’s biggest fraud” and its many voiceless victims; and how it resulted in a population explosion of humans that continues today. He unravels how history set in stone (literally) the first unjust laws that divided humans along the lines of class and gender in order to serve “the few.” Even with such divisions, Harari gives an interesting examination of how rulers sought to unite humankind. As rulers saw new knowledge as a path to becoming masters of the world, the third historic revolution fueled expeditions to new continents. Harari tells sad tales of how some of these expeditions turned into genocide and many civilizations disappeared. He makes us look at how on one hand, empires, with their technological improvements and accomplishments, have made life easier for humans. Yet the means by which those accomplishments were achieved resulted in a long list of crimes against humanity, and the plundering of many other of Earth’s life forms. 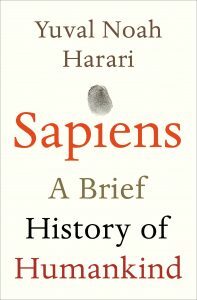 Harari brings together various disciplines as only a historian can, and asks: Did all the progress/advancements make things better? And if so, for whom? Also, what will it mean when science “tinkers with our genes” to the point that the definition of what it means to be human changes forever? In reading this book, I cried when I read about calves on a modern meat farm, separated from their mothers at birth, crammed into small stalls, who take their first long walk en route to the slaughterhouse. And I laughed at matriarchal bonobo chimpanzees with all-female social networks who gang up on uncooperative males to keep them in line. If given a choice between reading a tome on the scientific developments over the past century, a book on world politics, or a summary of the world’s religions, I would choose Harari’s book. It incorporates physics, chemistry, biology, religion, culture, geography, economics, and the ethics of domesticating a select number of living things for the advantage of one animal—Sapiens. 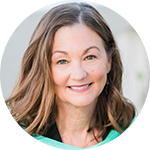 Melanie Holmes is the author of The Female Assumption: A Mother’s Story, Freeing Women from the View that Motherhood is a Mandate; which won a 2014 Global Media Award from the Population Institute.